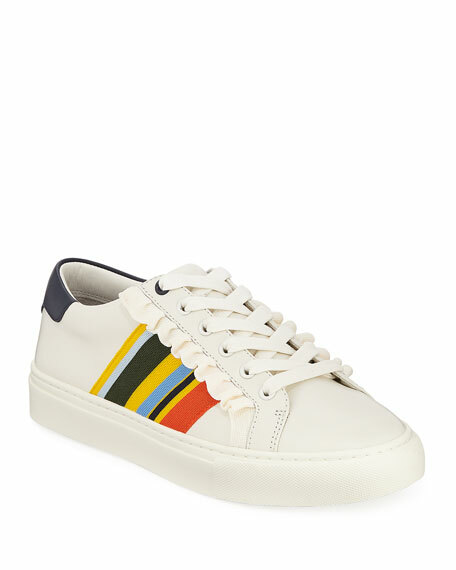 Tory Sport cow leather sneaker with striped and ruffled cotton trim and side stripes. Adidas leather low-top sneakers. 1" flat heel. Round toe. Lace-up vamp. Logos at tongue and backstay. Padded footbed. Rubber outsole. Adidas leather low-top sneakers. 1" flat heel. Round toe. Lace-up vamp. Logos at tongue and backstay. Padded footbed. Rubber outsole. "Continental 80" is imported. Sizing note: adidas shoes run large. We suggest that you order a full size smaller than you typically wear. 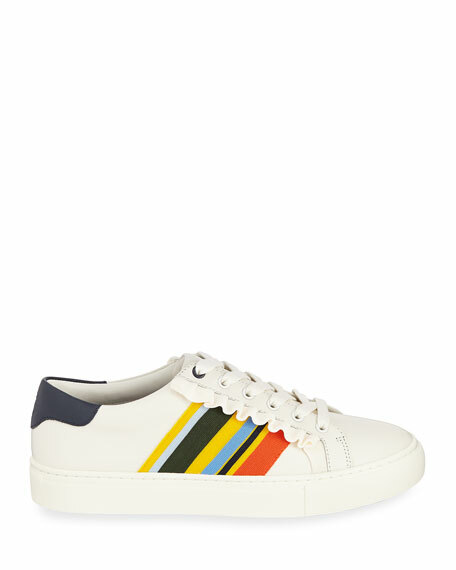 Adidas leather low-top sneaker with perforated signature 3-Stripes®. 1" flat heel. Round toe. Lace-up vamp. Logo panel at side. Padded footbed. Rubber outsole. "Sleek" is imported. Sizing note: adidas shoes run large. We suggest that you order a full size smaller than you typically wear. Christian Louboutin low-top sneaker in metallic leather, napa leather, and fabric. Round toe. Lace-up front. Padded collar. Pull-tab at heel. 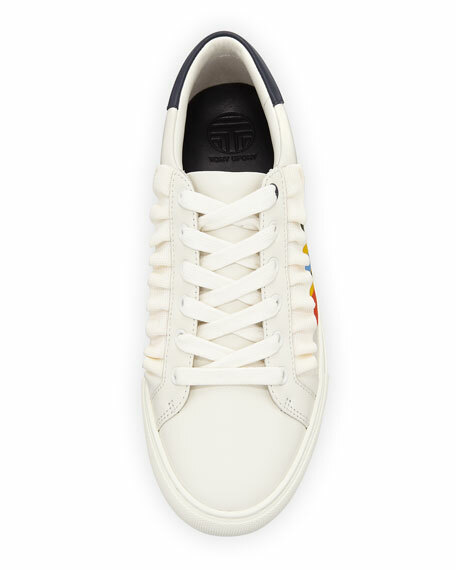 Christian Louboutin low-top sneaker in metallic leather, napa leather, and fabric. Round toe. Lace-up front. Padded collar. Pull-tab at heel. Red leather lining. Rubber outsole. "Aurelien" is made in Italy. Giuseppe Zanotti snake-embossed leather sneaker with metallic accents. Platform heel. Round toe. Lace-up vamp. Dual side zips ease dress. Metal logo at tongue. Pull-tab at back collar. Padded footbed. Rubber outsole. Made in Italy.